Did you know that my Ebook: Joomla 3 SEO & Performance contains a full chapter on the configuration and set-up of SH404SEF? 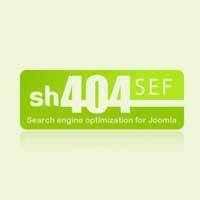 SH404SEF is probably the best known full SEO extension for Joomla. It is a commercial extension (Siteground users can use a Lite version for free) which has been around for a long time. It is available for all Joomla versions. It was an Editor's choice on the JED. It has a lot of potential to optimize your site, but for less experienced site administrators, the back-end can be a bit overwhelming. Also, with incorrect use of your settings and parameters, your SEO efforts might have an opposite effect, so be sure to know what you are doing. These additional features may be usefull, but you can leave them switched off. I will not discuss these in this article. 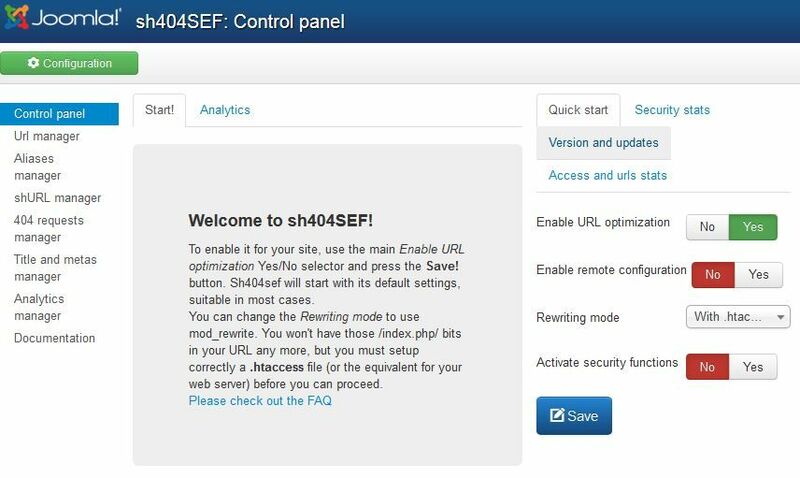 The main feature that SH404SEF is built for is to create nice-looking readable (SEF) URL's, avoiding duplicate content and rerouting all non-SEF URL's to the SEF ones trough a 301-redirect. Currently Joomla is quite capable of creating it's own SEF URL's, so that feature may not be the utmost important feature anymore, but duplicate URL's remains an issue that SH404SEF is quite good at managing. One thing that you should very much be aware of is that the extension will most likely build different URL's then core Joomla, so do not just activate the extension on a live site unless you know what you are doing! Joomla builds URL's based on how you link the articles to menu-items, which can lead to different routes (and URL's) to the same article. SH404SEF takes the category / article structure as a base, so that, no matter how you build your menu's, the final destination is a unique URL. Another feature to treat carefully is option to Purge URL's. Only do this if you know what you are doing, or if you are testing your site. On a live site, set your configuration and URL's and then leave the configuration! As soon as you set "Enable URL Optimization" to Yes, SH404SEF takes control of your URL's. Therefor it is best to make sure all your settings are correct. Out of the box, most settings should be fine, but you can finetune them all, so it is worth going through all of them. On the home screen, the "Rewriting mode" is an important setting to look into it. If you use it, it will use the .htaccess file, and removes the index.php from your URL's. Set a suffix for your URL's. Default is .html, but this does not make sense, so I always remove this. Create short-URL's as an alias for long ones. Unless needed, switch it off. And there many more, some of which are for real experts. Also you can set parameters for many extensions, like K2, Kunena, etc. As said, try to set it correct once, activate URL management and never touch it. Still, if you screw up, and you must really re-create your URL's based upon correct settings, you can purge all URL's and recreate them. Best is to do this on a local copy of your site. This screen allows you to see and update all your meta-data from a single view. Very handy to see if your metadata is there. Also you will see indicators about whether you are using the correct number of characters in your titles and descriptions. What is nice is that you also see these indicators if you are in the core Joomla view to update your article. Finally, what is extremely usefull is the 404 manager. All URL-requests that end up in a Page-not-found 404 error are logged and can be viewed from here. You can then very easily set a redirect to the correct URL, SH404SEF will suggest a new URL, based on whether or not it can find a URL that resembes the request. If you want to know more: my Ebook: Joomla 3.5 SEO & Performance contains a lot more information on this. As an alternative to SH404SEF, MijoSEF could be a competitor for similar functionality. Many happy clients already let me help them and they now enjoy higher rankings and faster websites!